You can use any ordinary kayak paddle on the sea, whether the European style with big blades or the slimmer Greenland style. The main thing is that it shouldn't break while you are using it. If you want to surf, visit caves and play next to rock gardens and reefs we recommend ordinary whitewater paddles. They're strong and have large blades for fast acceleration. They are quite short with a typical length of 74 inches (woman) or 81 inches (man). The blades are about 8 inches wide and slightly concave like a spoon, so that the "power face" of the blade grips the water when the kayaker takes a stroke. They are easy to buy, short enough to carry inside your vehicle, and give fast and powerful acceleration in surf. They used to have square ends, now they are all asymmetric. It's a fashion thing. In use, a whitewater paddle is usually held in quite a high paddling position with the top hand above the shoulder. Racing paddles are very nice for long trips in calm conditions but not for surf or rock-hopping. Their behavior during emergency brace and support strokes can be unpredictable, and they break too easily. Most racing blades will chip if you hit a rock. A really light racing / touring paddle may snap in half if you have to roll your kayak in difficult conditions. Typical length 81 inches (woman) or 87 inches (man). 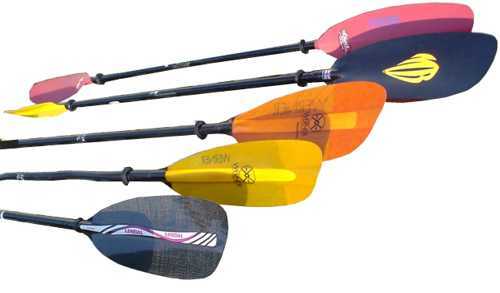 There are also some longer, slimmer paddles aimed at touring sea kayakers and intended for use in a low paddling position. This represents a move back towards the traditional Greenland paddle. The overall length of such a paddle may be 81 - 88 inches (woman) or 84 - 92 inches (man), with blades 6 inches wide. Longer is not necessarily better, especially in windy conditions at sea. We recommend that your main paddle be in one piece, not jointed in the middle. See Spare Paddle. It's not like getting a pair of shoes that fits. 200 cm (78 inches) would suit almost any adult unless they're already used to some other length. I'm 6 foot 3 inches tall and my favorite paddles are both 210 cm (83 inches) long. Sandy Ferguson of KASK is 6 feet tall and he likes his paddles to be 220 cm (87 inches) or shorter. Like me, he's a bit puzzled by a trend for manufacturers to recommend very long paddles, around 230-240 cm (90-94 inches), but at the end of the day, whatever suits the individual is fine. Paddles can be measured by standing with one arm raised up straight, with the paddle standing on end on the ground, and seeing how high the paddle comes up your arm. 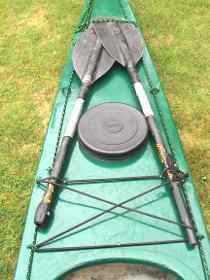 The guideline from official books (BCU Canoeing Handbook, BCU Publishing, 1995 and BCU Coaching Handbook, Pesda Press, 2006) is that the kayaker should just be able to curl the first joint of his/her fingers over the end of the blade. The shaft or loom of a Euro-style man's paddle is typically 1.2 inches in diameter. A few manufacturers also offer shafts 1 inch in diameter for kayakers with smaller hands. If your paddle shaft is a plain tube it is easy to add indexing. Just tape a thin pad along the paddle shaft on the the side of the paddle which faces away from you in basic paddling position. The centerline of the pad will be under the middle joints of your fingers. The pad can be 3/4 inch wide, 6 to 9 inches long and 1/4 inch thick in the middle. It could be plastic foam, or a 6 inch length of 1/4 rope, or just a half-dozen layers of duct tape. Attach it to the shaft by winding waterproof duct tape round it in a spiral. Whitewater, touring and racing paddles all have feathered or offset blades. In other words, the blades are at an angle which requires the kayaker to twist his/her wrist for every alternate stroke. The idea is that when the bottom blade is inserted in the water and pulled back, the top blade is able to slice forwards with minimum air resistance. That's great when you are going upwind but not helpful in side winds. In the 1970s, most paddles had 90 degree feather. This required a lot of wrist-twisting. As a result, some people developed medical problems such as tenosynovitis. A paddle with 90 degree feather also requires very flexible wrists if you're to be equally good at doing draw strokes, sculling for support and rolls on both sides of the kayak. Today's sea kayakers usually prefer a feather of 60 degrees or 45 degrees, and some paddlers like an unfeathered paddle where both the blades are in the same plane. If you never go near rocks or waves, you can use a 24 ounce (700 g) racing paddle. If you love reefs, caves and waves, probably your paddle should weigh at least 38 oz (1100 g) unless you go for full carbon fiber. Manufacturers don't generally want their products to last you a lifetime. 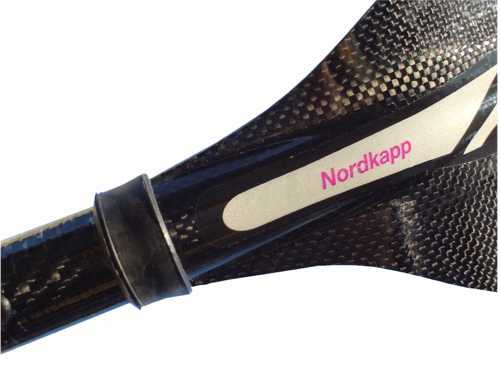 One Kayarchy contributor wants us to put in a word for the old Schlegel T60 Extreme paddle. He bought one in 1982 and has given it frequent hard use ever since, in the Alps and solo on the sea. The shaft is heavy-duty aluminum alloy and the blades are carbon fiber and high-density structural foam with aluminum edges. OK, he says, it weighs 50 oz (1400 g) but after 25 years testing up to Grade V in the Alps he knows it's not going to snap when the going gets tough. Unlike the others he has tested to destruction over the years. The blades of a good, light paddle can be made of wood, fiberglass or carbon fiber. Some have a core of high-density foam, some have an aluminum edge to absorb sharp impacts. A good blade can also be made from RIM. Depending who you speak to this may mean reinforced injection molded (nylon reinforced with fibers such as very thin strands of glass) or reaction injection molded (high density urethane foam). The shaft can also be made of wood, fiberglass or carbon fiber but another possibility is aluminum, as long as it is a thick-walled extruded tube as in the old T60 Extreme. The life expectancy of a cheap-and-nasty aluminum shaft (tube welded up from thin sheet metal) is very short. An alloy paddle shaft should have a wall thickness of at least 18 swg. Even a good aluminum shaft is cold and slippery so it needs to be covered with a plastic sheath or some waterproof adhesive tape. And see Metals & Salt Water. There are plenty of kayakers who would give up chocolate sooner than part with their favorite wooden paddles by Kober, Azzali, Lendal, Mark Gees or Triton. However, wood has to be laminated, sculpted, smoothed and varnished so many manufacturers have dropped it altogether and use only materials that can be shaped in a mold. See Retail Outlets for paddle manufacturers using only composites and those who also use wood. Wooden and plastic composite paddles which are stored for a long period can slowly warp under the influence of gravity, so they're best kept either on a horizontal shelf or hanging vertical. One extreme is the plain black carbon fiber paddle, which undeniably looks good and does not signal your presence to wildlife for miles around. However if it falls into the sea during a crisis you may never see it again. Paddles tend to break only in difficult conditions, so not the ideal time to start learning how to use entirely different equipment. If your main paddle is a Euro-style one, it's probably best if your spare paddle duplicates it. In that case your spare will have to split into two halves, to carry on deck where you can reach it quickly. Spare paddles that split into three pieces are really for whitewater kayakers, who carry them inside the kayak and expect to assemble them while standing on the riverbank. Most sea kayakers keep their spare paddle under deck rigging on the rear deck; others feel that it is better to keep it on the front deck where they have a much better chance of grabbing it and assembling it in an emergency. While upside down, for example. This one, made by French company Egalis for sale by Decathlon, folded in half on about the tenth occasion it was used because the aluminum tube which provided all the strength for the joint had slid out of position, leaving only a floppy nylon tube linking the two halves of the paddle. Fortunately although this happened about two miles offshore, the sea was flat calm. Your editor no longer had proof of purchase, but Egalis posted him a replacement joint. The ends of the shaft of a jointed paddle must be sealed, or if you drop one half into the sea it will instantly sink. A good method is to insert permanent plugs into the shaft, made of cylinders cut from a sheet of polyethylene foam, of a slightly larger diameter than the inside diameter of the shaft. Smear the sides of each plug with sealant before inserting. Ideally, use a polyurethane marine sealant such as Sikaflex. If that is not available, you can achieve quite good results with the sort of silicone sealant used by building contractors when fitting windows. If you normally paddle with a traditional Greenland-style paddle and often practice the sliding stroke, your spare paddle can be a one-piece Greenland storm paddle. A storm paddle is the same as your main paddle but so short that it can be carried on the front deck of your kayak in one piece. If necessary you can easily grab it and roll up. A paddle float can be attached to a spare paddle and used to stabilize a stationary kayak during self-rescue. Even if you can roll your kayak every time, a paddle float could come in handy. Many designers of commercial paddle floats keep them neat by keeping them small, which means they are not going to give you much support in a rough sea. Wine drinkers can easily make a paddle float at home. Drink the contents of four 3-liter wine boxes, throw away the cardboard and you have four very tough multi-laminated plastic bladders, each with a handy inflation valve. Then all you need is a waterproof nylon bag with a draw-cord at the neck (you can use a sleeping bag stuff sack with a circular base 10 inches in diameter and a cylindrical body 14 inches long) and a little imagination.